Gastronomes have always been an aphoristic race. They like to express themselves in contented little burps. "Tell me what you eat, and I will tell you who you are," said the 19th century epicure Jean Anthelme Brillat-Savarin, between petits fours. "A cucumber should be well-sliced, and dressed with pepper and vinegar, and then thrown out, as good for nothing," declared Samuel Johnson, Britain's 18th century man of letters. And it was just a few decades ago that Fernand Point, the father of modern French cuisine, uttered, "Butter! Give me butter! Always butter!"  a battle cry that could easily have been inscribed on his tomb. So why is it, given all the material they have to work with, that today's culinary luminaries can't Twitter worth a damn? It's frustrating, because the owners of these streams are the very cream of the food world. If you dined with them, you would hang on their every word. What comes from their streams though, is usually like this one, from Frank Bruni, which just came across my line as I was writing: "The cashew is a damned fine nut. A little nut mix just reminded me of that, of why I don't keep cashews at home. Perilous." O.K., got that. Cashews are tasty. Right. A few moments before that, Regina Schrambling, generally the most caustic and fearless voice in the blogosphere, had this to say: "Zucchini pancake went down the fanged hatch. (Mine, too.)" Poetic, yes, but pointless. Who cares? Ruth Reichl too wants us to know what she's eating. "Cold rain. Hot tea. Matzo brei morning. Good day to curl up with a warm fire, a cozy cat and the adventures of Jacob de Zoet." I am bored to tears by such updates, but I understand that a lot of people like them. Reichl has a hell of a lot more followers than I ever will. The problem is that even the most wide-ranging food guru spends most of his or her time eating matzo brei. We're obliged by the existence of Twitter feeds to broadcast it, and in fact, for a lifestyle doyenne like Reichl, whom whole armies of women look to as a role model, it would be unfair not to. But the Twitter box is always hungry, like the chirping bird that is its icon. Its beak is open, ready to be regurgitated into in the form of a retweet. The people who tweet all the time get the most followers. But the more they tweet, the less I want to follow them, and the harder it is to pay attention. How many streams are you supposed to follow? How often are you obliged to go back and see the ones you missed? It's not just an abstract question. The streams I like most from the outside world, like Bill Simmons of ESPN or Jessica Coen of Jezebel, are so good that I go to their Twitter home pages periodically to see what I've missed. I never do that with my food streams, and the reason is obvious. They're as ephemeral as yesterday's mashed potatoes, as the old saying goes. Food  even on the Twitter streams of the very food gods!  is something the tweeter has in front of them or happens to be cooking. 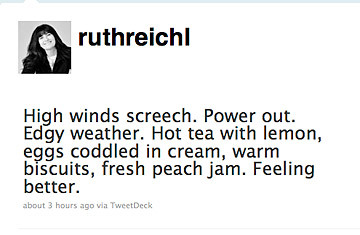 Sometimes there's some value there, as when Reichl followed up her matzo brei tweet with a link to what might be the second starkest recipe ever written (this is the first). But most of the time the writer doesn't even have a single formed idea. It's not a question of intelligence. Some tweeters, even some whose thoughts we would not otherwise attend to, seem to have mastered the form: "Listen to your heart," Kim Kardashian advised us the other day; "rise and grind" was even more laconic, but all the more evocative for that. No, the problem is that none of the people we look to for guidance about food ever step back before they tweet. It's a medium of micro-focus, like the digital cameras that can capture a seared scallop with majestic craggy accuracy, but can't ever seem to snap a picture of a sunny sky. Something as large as food can't be written about in 140 characters unless you are emitting utterances that extend beyond the limit of that morning's matzo, and too often, they don't even try. In their own way, the likes of Brillat-Savarin and Point were tweeting; the difference is that they were tweeting to an imagined posterity, a future that would care about what they were saying. That should be the test everybody's tweets are held to. And I'm going to start with myself. Expect no more tweets from OzerskyTV that lack a developed thought, that listlessly and lazily note what's on my plate or my mind, that reply to a question I don't bother to copy or that treat food like it's not worth thinking about. It's O.K. if Kim Kardashian does that. But if food is worth eating, it's worth thinking about, and if it's worth thinking about, it's worth saying, and saying well. Even on Twitter. Now excuse me while I think of something deep to say about the fried chicken I just ate.